Tonight, Tuesday 30 at 7 pm, Meta House presents the launch of Vanishing Act, a book by Ryun Patterson and Rick Valenzuela that delves into the life and work of Cambodia’s mystic healers and fortune tellers. An accompanying exhibition includes portraits and anecdotes from the people they met in producing the book. The evening will include an artist talk with the authors. At JavaArts gallery on Wednesday 1, the closing event of No Boundaries, an artist-run exchange project between Cambodian and Indonesian artists currently on show at Java Café and The Asia Foundation Community Art Gallery (#59, Street 242). Site-specific performance by Diyano Purwadi and Tiarma Sirait. From 7 pm. This weekend, Friday 3 and Saturday 4, the Phare Ponleu Selpak open days features a visual art exhibition and performances from senior students in circus, music, theatre, dance and animation. The event will open with a selection of special circus, music, dance and animation pieces performed under the big top at the PPS campus, a concert commencing at 9 am on Friday 3. Activities continue through both Friday and Saturday, 8 am to 6.30 pm. On Sunday 5 at Meta House, The Piano Shop Concert Series continues with a cross cultural music/poetry performance, featuring poetry by Pal Vannarirak, E Soedergan and Eva Tina Byggamaester, and music by Ulf Aehlsund, De Fallas Villa Lobos and Norodom Sihanouk, performed by Anders Delin (guitar), Him Savy (flutes), Karl Jan Rahm and Pal Vannarirak (poetry). $10/$3. For reservations contact 077 787 038 or 016 985 828. From 8 pm. Next week, on Wednesday 8, there is a special performance of Hamlet by Shakespeare’s Globe Theatre at RUPP Auditorium. Students free, adult price $5 – tickets go on sale from Wednesday 1. Tuesday 30 at 7 pm, Meta House presents the launch of Vanishing Act, a book and exhibition by Ryun Patterson and Rick Valenzuela that delves into the life and work of Cambodia’s mystic healers and fortune tellers. Wednesday 1 at 7 pm at JavaArts gallery, the closing event of No Boundaries, an artist-run exchange project between Cambodian and Indonesian artists currently on show at Java Café and The Asia Foundation Community Art Gallery (#59, Street 242). Friday 3 and Saturday 4, from 8 am to 6.30 pm, open days at the Phare Ponleu Selpak circus school with many activities. Special concert commencing at 9 am on Friday 3. Sunday 5, 8 pm at Meta House, The Piano Shop Concert Series continues with a cross cultural music/poetry performance. $10/$3. For reservations contact 077 787 038 or 016 985 828. At Meta House, an exhibition by American artist Renee Cirlincione Smith, Lovely Skies. Tonight, Tuesday 9 at 6.30 pm. the French Institute presents an evening with children’s author and illustrator Michel Van Zeveren, launching an exhibition featuring illustrators from L’Ecole des loisirs, the French children’s book publisher celebrating its 50th anniversary this year. The exhibition is in three parts: L’Ecole des loisirs around the world, Making a book, and Our favourite heroes. The exhibition is in the hall of the language centre; the talk will be held in the cinema. On Friday 12 from 6 pm to 8 pm, Sa Sa Art Projects at the White Building, Sothearos Blvd, presents an Open Studio evening with artists in residence Eng Rithchandaneth and Mok Sombo. In contrasting work, through sculpture Daneth explores the social and political implications of hand gestures, while Sombo uses performance and video to consider the nature of politics and power. This weekend, Friday 12 through to Sunday 14, Cambodian Living Arts launches the new season of Plae Pakaa at the National Museum, 7 pm to 8 pm. On Friday, Cambodian opera, The Story of Mak Therng; on Saturday, folk and classical dance, Dancers of Bassac, and on Sunday large shadow puppetry, The War of Indrajit: an episode from the Reamker. This programme will continue through to August. Tickets ($15) are available online via www.cambodianlivingarts.org or at the Plae Pakaa ticket office at the National Museum, Phnom Penh. This weekend at the Department of Performing Arts (see number 14 on this map), the Francophone Theatre Company of Phnom Penh presents Huit Femmes, a French comedy thriller by Robert Thomas. Friday 12 and Saturday 13 at 7 pm, then Sunday 14 at 4 pm. Tickets $7 at Gasolina, Kwest and Carnets d’Asie, or $8 on the door. The Music and Art School of Siem Reap has launched a crowdfunding campaign to raise money for the purchase of musical instruments and associated materials. Read about the campaign here, and learn more about the school here. Dance World Cambodia will hold its fourth annual summer program from June 22 – July 10 in Phnom Penh and July 13 – 18 in Siem Reap for ages 3 to 16, covering everything from classical ballet and contemporary to jazz and modern dance. Read all about it. Tuesday 9 at 6.30 pm. the French Institute presents an evening with children’s author and illustrator Michel Van Zeveren, launching an exhibition featuring illustrators from L’Ecole des loisirs, the French children’s book publisher celebrating it’s 50th anniversary this year. Friday 12 from 6 pm to 8 pm, Sa Sa Art Projects at the White Building, Sothearos Blvd, presents an Open Studio evening with artists in residence Eng Rithchandaneth and Mok Sombo. Friday 12 through to Sunday 14, Cambodian Living Arts launches the new season of Plae Pakaa at the National Museum, 7 pm to 8 pm. Tickets ($15) are available online via www.cambodianlivingarts.org or at the Plae Pakaa ticket office. Friday 12 and Saturday 13 at 7 pm, Sunday 14 at 4 pm at the Department of Performing Arts (see number 14 on this map), Huit Femmes, Francophone Theatre Company of Phnom Penh presents a French comedy thriller by Robert Thomas. Tickets $7 at Gasolina, Kwest and Carnets d’Asie, or $8 on the door. Bophana Center presents Ratanakiri, an exhibition of photographs by Cédric Delannoy. 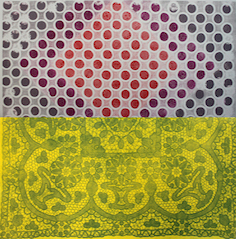 Meta House, hosts a retrospective of work by textile and print artist Marine Ky, Optical Screens and The Earth, curated by Dana Langlois. Runs until 28th June.